Every few weeks I get an email or a call from someone in leadership of one of our Unitarian Universalist congregations asking how they can set up an outreach program to military veterans, servicemembers, and families. For a long while, I would send them the information I have on the UUniforms program conducted by the UU Church of Norfolk, Virginia. I still send that information when requested, but I do so with a bit more trepidation. Why? Three reasons. First, I do not believe there is a lack of veterans in our congregations. As I have visited dozens of congregations in eight states, I have yet to have one where veterans of WWII, of Korea, of Vietnam, and of Desert Storm and Just Cause did not come up to speak to me afterward. What I have instead found is that these veterans within our congregations have felt for years that the stories of their military service (often the most formative years of their lives and their faith) are not welcome within the walls of their churches and fellowships. Often, after I am the guest preacher, they will come up and tell their stories to me, because a military chaplain candidate appearing in their pulpit seems to have given momentary permission for those stories. These veterans have found their way to our congregations and to our faith, even if it means that there is a part of their lives that they feel they cannot openly bring forward on Sunday morning. There is something about our faith that is so attractive to them that they are willing to keep this part of their life story silent for fear of offending others and no longer being accepted in our faith. They choose not to challenge some of the assumptions about military people and life that are extant in our churches, because they fear being ostracized, or being defined solely by their military past. So, are those people in the military really able to understand Unitarian Universalism? So as a UU military chaplain, do you get to help people become conscience objectors? I didn’t think there were any military people in our churches. Are you sure? Ahh, so you are going in the military because of how hard it would be for a veteran to be called to a UU church as a minister, right? This small collection of questions I have received come from the more benign assumptions many UU’s have about military service. Five years ago people would directly challenge whether or not I am really a Unitarian Universalist because of my military service. Now I’m just exotic. My point for sharing these comments is this: As a military chaplain candidate I cannot help but be a lightning rod for these questions, but the comments and commentary behind these assumptions are deeply ingrained in our congregations. The veterans in our pews know this, and in order not to offend, they leave part of who they are at the door. So, my second reason why I am reticent to help congregations with “outreach” efforts to military veterans is that I’m not sure we are ready to provide the kind of environment these veterans might need in a faith community. Those who are able to be in our pews seem to be finding ways to them without our help. Outreach is an external act. Outreach programs are about bringing what a congregation has to offer to those outside the congregation. The motivations for outreach vary, especially in a faith that does not have evangelism as a faith imperative. In speaking with those who have contacted me about military and veteran outreach programs, the motivations have varied from seeing it as a way to increase church membership (and pledging units) to a desire to “save” these individuals from their reactions to combat. This past two weeks, I have been studying the relationship between spirituality, combat resilience, and combat stress disorders (PTSD and others) at the National Defense University in Washington DC. In those studies, I came across a program by a group of Native American counselors and psychologists that uses Native American ceremonies and spirituality as a framework for helping people learn to cope with PTSD. One of the primary ingredients in their formulae is a ceremony that formally recognizes that the veteran (warrior) has been deeply changed by their experience. The ceremony allows the veteran (warrior) to tell the story of their service, and that story is formally and officially order imitrex taken in as a part of the community. The veteran (warrior) is honored for their service, and the responsibility for that service is spread among the entire community, so the veteran (warrior) does not have to carry it alone. The veteran (warrior) then formally re-enters the community as an honored and respected member. Several psychological studies of PTSD have shown that how the community accepts and welcomes the military veteran back from war has a deep impact on the rates in which reactions to combat stress become a disorder that impairs social functioning. Anecdotally we can see this difference in the rates of acute combat stress injuries from WWII and from Vietnam, and make the connection between how the veterans of each of those wars was received by the communities to which they returned. I believe many of our congregations are not ready to receive these veterans in the way they need to be received by a faith community. Some of the congregations that have contacted me have expressed motivations that made it clear they were not ready to hear the veteran’s stories and welcome them in the way they need. So, if not outreach, then what? I applaud the energy that some congregations have shown around the issue of veterans, military families, and military servicemembers. I have written and spoken of my belief that this nation is about to face a spiritual crisis that makes the aftermath of Vietnam look mild. I believe that there is a salvific nature to Unitarian Universalist Faith that can play a deep role in the spiritual healing of some of those veterans, just as it did in my own life. But I also believe that our congregations are not yet ready for that role. We as a denomination know how to get ready to play a positive role in helping our veterans, their families, and our nation weather the spiritual storm I see on the horizon, because we have done it before. I have begun to recommend (and develop resources for) our congregations to take a deep look at our own reactions, assumptions, prejudices, and relations to the military, to war, and to our veterans through something similar to the current Welcoming Congregation program for GLBTQ persons and communities. We need to deepen our understandings of ourselves, of our own responsibility for the wars and conflicts our veterans have been sent to fight. We need to have a deeper understanding of the processes of recovery of those struggling with PTSD and other combat stress injuries, and to see how what might otherwise be an innocent and unthinking comment can be deeply damaging to a veteran’s recovery and to their trust in this faith. We need a commitment to a different balance between pastoral needs and prophetic impulses. I think of a military spouse whose loved one was serving in Iraq, and her church kept asking her to go to protests against the war. When she said no, some people questioned her UU faith. Becoming welcoming for veterans and their families will require some re-evaluation of our priorities of faith. We need a deeper understanding of the chronic nature of combat stress injury, and of how family members of veterans of the wars in Iraq and Afghanistan are themselves showing signs of stress injuries (called secondary traumatic stress disorder) brought on by the immediacy of modern telecommunications and the manifestations of repeated deployments. More than this, we need to deal with the feelings that many in our denomination have in relation to their own involvement in the spiritual crisis in the lives of our veterans and the life of our nation in the aftermath of Vietnam, a set of feelings that I have often perceived as including shame, regret, and denial. We have some healing to do ourselves, before we can really welcome military veterans and their families into our congregations. The shame of our involvement in the aftermath of Vietnam is the third reason why I am reticent about supporting outreach efforts to military veterans. I know I am being controversial by even saying this aloud, but there is a spiritual and emotional “ghost” in our denominational system that has not yet been exorcised, and until it is brought into the light of day and we heal from it, we will continue to be motivated towards this kind of outreach for all the wrong reasons. So, if you contact me for advice on outreach to military veterans, be prepared for me to turn the work back upon yourself. Rather than seeking to bring veterans to our congregations, let us first prepare our congregations to receive them. If we do that, those who need us will find us. I promise. I do not usually explain a photo, but I felt I should with this one. The photo is of the marker of the resting place at Arlington National Cemetary of the cremains of Rev. 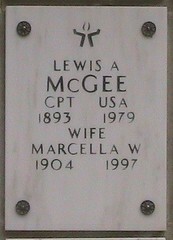 Lewis McGee and his wife Marcella. Rev. McGee one of my personal heros in the Unitarian Universalist ministry. As I was walking in the Columbarium, I came across his marker, and it brought tears to my eyes. You can learn more about this veteran of both the Army and our ministry at http://www.cedarlane.org/08serms/s080113.pdf, or in the book Black Pioneers in a White Denomination by Rev. Mark Morrison-Reed. I retired from the Air Force in Jan 09, became the lay minister of the UU Church of Tullahoma, TN in Feb 09, and will begin seminary at Vanderbilt Divinity School in August. I just found your blog, and am eager to read your posts. Our church is probably anomaly within UUism, but of our 43 members, the majority have either served in the military, are a military spouse, or have civilian ties to nearby Arnold Air Force Base. Our members freely share their military stories, and our congregation is completely supportive of the military. I have had many interesting experiences as I attend district conferences, UU leadership training, and even a minister’s conference. Some wonder how we can have some many ties to the military. Doesn’t this conflict with the fact we love peace? I ask them if they would advocate completely disbanding our military. I’ve yet to find anyone who advocates that. My second question is “So who do you want in the military, thuugs or people of conscience?” At this point, the light buld usually goes on. I also point out that UUs make the best chaplains, and we need far more of them. My best wishes to you. Are you familiar with The Coming Home Project? This program offers retreats and group support for veterans. I recently met one of the directors, Joseph Bobrow, at a Buddhist chaplaincy open house. He is a practicing Buddhist, and we shared some of our experiences in providing outreach to veterans. I believe that some Buddhist sanghas may be similar to UU congregations in being uninformed and unprepared to offer support to veterans; I’ve also been asked many of those questions you were asked, although in a Buddhist context! Fortunately, I think this has been a minority view, and much of the response to my military chaplaincy work has been positive. However, I can understand your reticence regarding outreach – many veterans need to be honored and respected for their service, and I worry that the concept of “outreach” may not include this. I believe that some Buddhists, and perhaps UU congregants, will not “get” this, and assume that the only “appropriate” response of the veteran should be shame, remorse, and atonement for any kind of military service, even not involving combat. Perhaps it cannot be understood unless one has actually served in the military, and maybe outreach should be spearheaded by veterans. I’m not a 100% certain this is true. I’m guessing most of an age to remember have no qualms about what was said and done about Vietnam. It is an interesting aspect to Obama’s supposed attendance at a UU Sunday School in the 70’s and a Church that also sheltered guys AWOL from the service. Still your right about the need for a great deal of reflection about the 60s and 70s. If people wonder what happened to Liberalism, well it died right then and a good many of us did the work of demolishing it. Not right wingers… we did. I remember the lost looks on my Liberal elders. Doug — I know that there are some exceptions out there of congregations that are more prepared to welcome veterans of the current conflicts than others. I would put my internship church in that category, not because of any work I did, but because of much of the work that they have done. I also know that there are a few congregations that are very connected to the military— and many of those congregations have faced similar experiences to the one you described when they connect to the broader UU Movement through district and association events. There are also some churches out there that find a good balance, many of them in the areas immediately around large military bases. I am specifically thinking of San Antonio, of San Diego, and of some of the DC churches. But in this case, I would be likely to argue that the exception proves the rule…. Yuinen — I am familiar with the Coming Home project, and was even involved in exploring with a Zen Center in Oak Park IL what that might look like in the Chicago area, till I could no longer meet my commitments due to other requirements (like seminary). It is a good model, in part for the Zen skillful means of bearing witness. I found that the Zen program gave more space to veterans to discover and share their own stories and experiences than might be encountered in a similar effort in other places. Thank you for reminding me of it though… it might appear in the paper the Army is paying me to write here at NDU. Bill — I knew I was being controversial with the word “shame”. It is a loaded word, and I used it with intent. I may be wrong, but that is what I have seen around the issue of veterans. I have seen it manifest as anger at even the idea of veterans and military people in a UU church (thankfully a rare reaction), to a defensiveness (even when I was deliberately trying not to be sensitive), to a few deeply emotional encounters with people who were deeply involved in the peace in Vietnam movements. There is a hair to split here… and I need to split it. What I have encountered has been deep pride at helping to end the war, and regret and guilt at some of the things done in the process of making that happen. I personally am proud of our faith’s involvement in bringing an end to that war, even though I was barely born and baptized as a Southern Baptist at the time. If I could say what I am trying to say without implying a critique, I would. It was a time of excess in many things, including in the reaction many in the peace movement had towards veterans. But we need to realize that this complex dynamic in being rightfully proud of what was accomplished and ashamed of some of the means that were used has created a very complex ghost in not just our denomination’s relationship to war, but in our nation’s relationship to war. After Vietnam, this complex emotional knot was swept under the rug, and it continues to affect who we are and why we do the things we do. As a religious faith, I think we need to talk about it. I think we need to look closely at that time period and the years before it, for they have formed much of who we are today. There is great good in this, but there is also some baggage we carry. If we are ever going to lighten that baggage, we need to open it.